Leafless East-Indian Vine is a climber with stems up to 2 m long,, twining, green or gray, hairless. Flower cymes are borne at branch ends or in axils, 6-15-flowered, about 1 × 2 cm, carried on 3-5 mm long stalks. Sepals are ovate, about 1 mm, margin translucent. 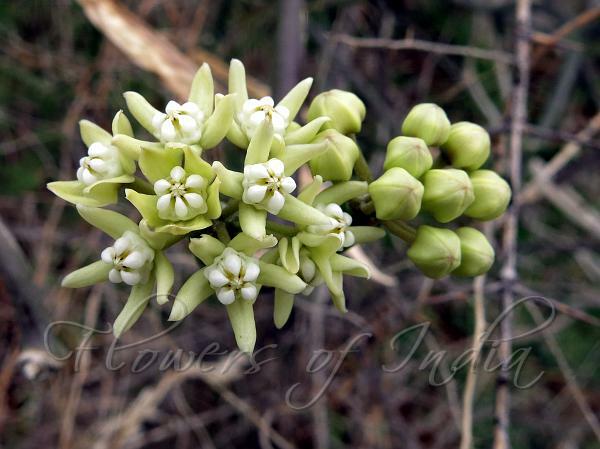 Flowers are white or yellowish, petals ovate-oblong or oblong-lanceshaped, about 3 × 1 mm, hairless. Outer corona is shallowly cupular, inner lobes obtuse, slightly shorter than or as long as anthers. Seed-pods are lanceshaped in outline, round in cross-secion. about 15 × 1 cm. Seeds are broadly ovate, about 3 × 2 mm. 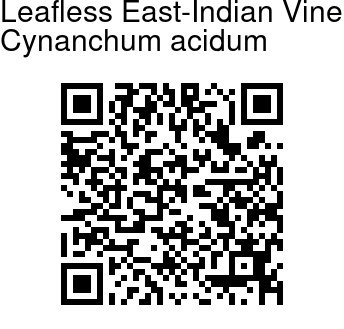 Leafless East-Indian Vine is found in seashore thickets in India, Myanmar, Nepal, Thailand, Vietnam and China. Flowering: March-November. Medicinal uses: In Siddha medicine system, this plant is used in treatment of respiratory ailments like mild bronchospasms,allergic rhinitis, sinusitis, coryza or common cold. Identification credit: N. Arun Kumar Photographed in Karnataka.